Plastics make up the largest quantity of the non-biodegradable material contaminating the world’s oceans and is a huge environmental concern because its longevity means that it can be distributed over huge distances from its origin, and accumulate in remote areas such as the Poles. Once in the ocean, mechanical and biological processes cause plastics to break down into microplastics, which are difficult to remove from the ocean and are a threat to the diverse marine food webs and ecosystems supported by polar waters. Nanuq-Manta was the first study to assess the presence and distribution of microplastics in the Arctic waters at 82°7N of latitude. The Polarquest team carried out microplastic sampling across the Arctic, using the Mantanet. Learn about how the team collected these samples in "Recipe: How to sample microplastics in the ocean". Water samples were collected in the top 16 cm of surface water and sub-surface samples from the vessel’s on-board seawater pump, situated 6 m below the surface. This will allow for future microplastic monitoring and to a risk assessment of the potential impacts of decreasing sea ice, increasing shipping and commercial activity. 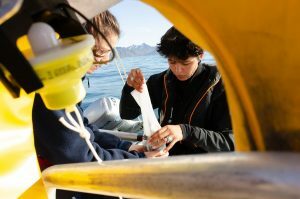 Safiria Buono collecting microplastics in the Arctic waters. Safiria describes more of her experiences sampling microplastics in the Arctic in "Dispatch from Nanuq: taking the Northern-most microplastics sample". Look forward to more scientific results from this project, as analysis is ongoing on the samples. Read about Nanuq’s 2016 microplastics sampling campaign. Read our feature article on Nanuq’s search for the 6th microplastic island, in the Arctic ocean. Contribute to Polarquest2018 Microplastic campaign.